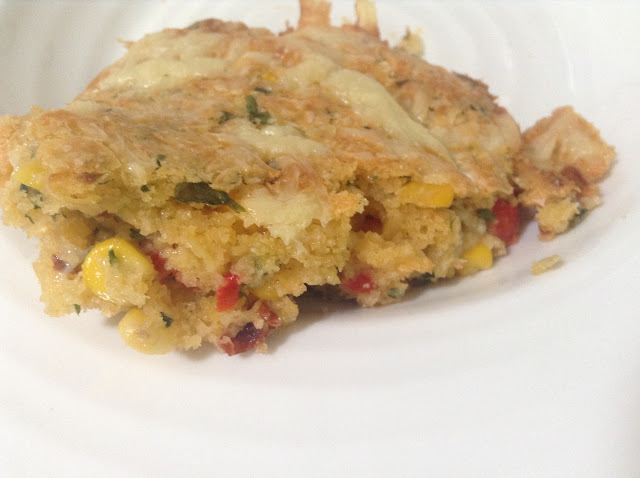 Of course I'm assuming that the Southwestern Corn Spoon Bread (this month's Bread Bible project) is a close cousin of the run-of-the-mill Thanksgiving sidedish-type cornbread. Spoon bread it turns out is exactly that, bread that holds together but needs to be spooned out of the dish rather than sliced and served. I'm now a big fan of spoon bread and possibly cornbread as a whole, if they're all like this recipe. I found this crispy, spicy and deliciously savoury. *Spaghetti Bolognaise - an Australian knock-off of an Italian dish which is spaghetti with beef mince and tomato sauce. The popularity of polenta is why I ended up using something called polenta tradizionale (a less common polenta type that is white-ish coloured where most polenta is bright yellow). The other reason is that in Darwin food supplies are almost all trucked in and are very feast or famine in character. So last time I browsed the aisles of my favourite grocery shop, they had every type of cornmeal/corn flour you could wish for. When I went to buy the cornmeal this time, almost nothing. I first came home with a packet of Pan, but after some googling I realised that it was a pre-cooked corn flour rather than a meal. I think I could have used it but the result would be more cake-like due to its finer texture. I know you can use yellow polenta to make cakes so I thought my polenta purchase would be fine. This was a fun week for new ingredients (rather than my usual excuse to buy new equipment) because I also got to buy the exotic sounding chipotle in adobo. I'd heard of it before but, never having cooked anything Mexican besides nachos and guacamole, I'd never seen it up close. It turns out to be chillies in a very smoky, vinegary sauce. The smokiness reminds me of the Spanish smoked paprika and I suppose it would make sense if they were related. I thought it was delicious and I'm planning what to do with the leftovers. 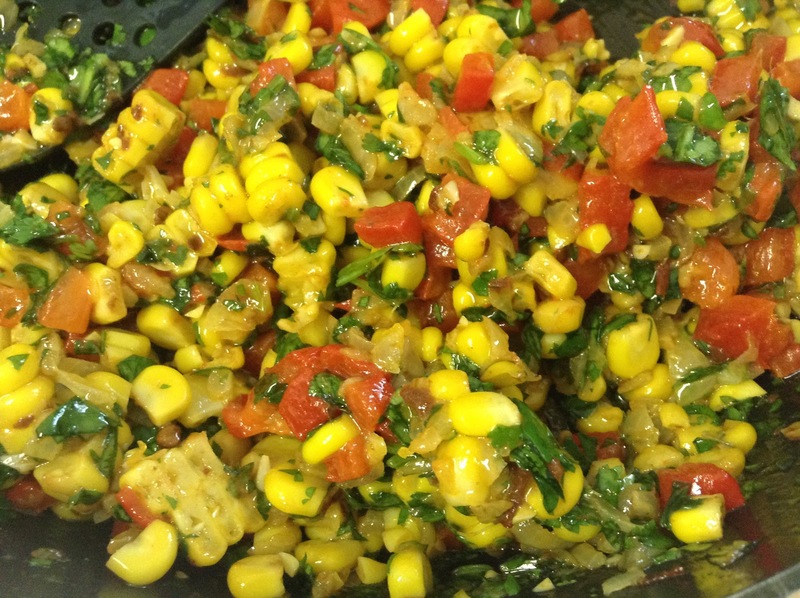 This recipe is full of vibrant colours and flavours. The need to roast and peel the red pepper (and cook the corn) makes this dish just out of the realm of quick and easy. I realised if I was feeling really lazy I could buy some of those Spanish roast red peppers that were sitting on the grocery shelf next to the chipotle in adobo. More great colours - that's the only reason for this photo, except perhaps to show you the delicious flavour mix of the vegetable part of the recipe. My only possible issue with this recipe is the 3 tablespoons of sugar in the batter. I wasn't going to add any until I realised how hot the chipotle was and thought it may need to be offset by some sweetness. I added 1 tablespoon but next time I wouldn't add any at all. I don't think it needs it, especially with the sweetcorn. The colour in the finished dish didn't come out very well in the photo - it was a lighter, more yellow colour in real life. The cornmeal made the edge bits particularly delicious and crunchy. I've been thinking about what shape dish would give you more edges - maybe a very long, thin pan? Aha! A good excuse to buy more equipment. This recipe could not get any better. Next month we're baking Traditional Challah. Loved your post. The bright colors made me smile too. I thought the recipe was fantastic. Kitchen equipment and gadgets are so enticing and hard to resist! 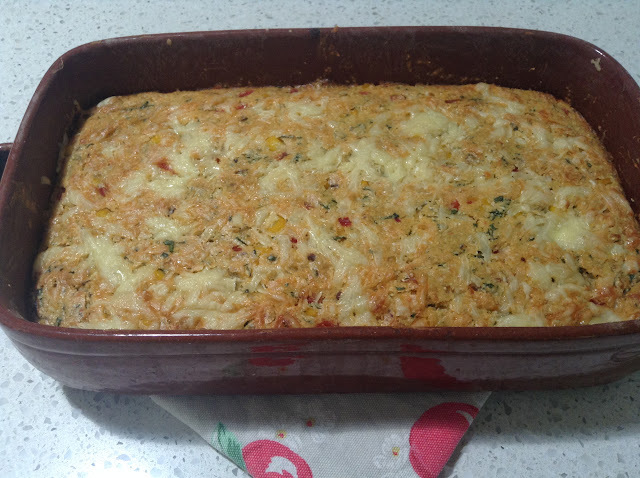 What fun that this is the first time you've had a cornbread type dish. We take it for granted here. It comes in all sorts of textures from grainy rustic to light cakey. There is a cast iron pan that has individual corn cob shapes to give a higher crust ratio but I bet muffin pans would do the same thing. Your's turned out perfectly! so glad your first spoon bread was this one! and what gorgeous photos!!! Looks interesting! I love seeing the picture of your whole bake in pan...at least I get to see how it actually looks in the pan like this since I never made one. But I don't think I will be making it..looks like a lot of corn and no one in my family likes corn except me!